I’m a sucker for the nobly grandiose, so when you hand a me cigar I’ve never heard of that sports a vibrant label with aristocratic calligraphy and golden edges, you can rest assured that I’ll be happy to give it a shot. 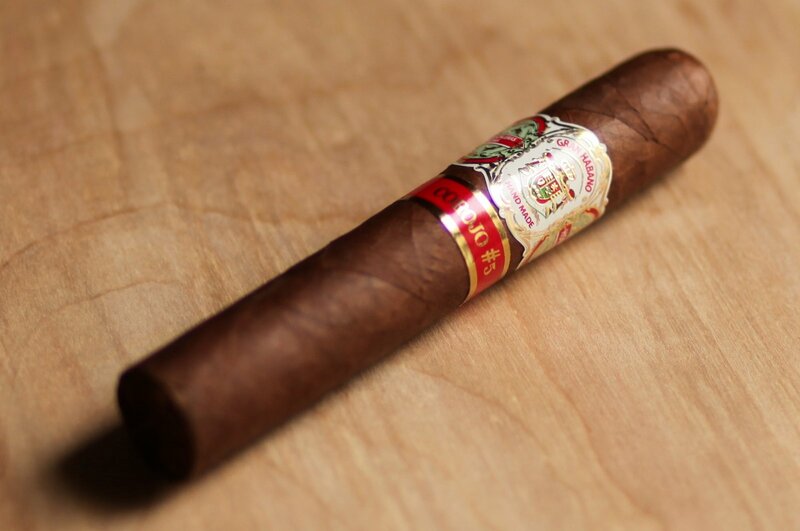 Gran Habano is the brain child of third-generation tobacconist Guillermo Rico. The idea behind this Honduras-based company is to offer quality cigars made the old fashioned way at an affordable price. It’s a noble venture, and I look forward to seeing how the cigars hold up to the mission! This Gran Habano Corojo #5 could be in better shape. Part of the veiny and rugged wrapper that was chipped off in the midsection somewhere along the way, and the body is packed quite tightly, almost to the point of being downright brittle. On the bright side, however, the cap is in perfect condition: no openings, no unraveling, just an excellent garnish with the seams perfectly sealed and stacked on top of each other like the rings of a tree trunk. The foot sports a cold odor of faint pepper, as does the wrapper. Despite the extra tightness of the body, the draw is borderline perfect, although this might have something to do with the whole in the midsection of the wrapper, which takes a lot of air out of the body and accordingly obscures the flavor. The flavor itself (when I can taste it) is a pleasant, though slightly immature, with a sourdough bread note in the foreground and some salt in the background. The retrohale initially has no flavor whatsoever. The smoke clouds, though are just the way I like ’em; thick and aromatic. The burn is also quite even, which mediates the wrapper dilemma. Things thankfully start to pick up as the wrapper hole in the midsection of the body is slowly eaten up by the burn, which is still even at this point. The flavor profile begins to change and expand as the foreground’s flavor gets incrementally more woody and musky as the second third progresses. The background of the flavor still has its salt, but it is eventually joined by the pepper that was hinted at in the cold odors before lighting up. The draw remains surprisingly smooth, even after the wrapper hole is eaten up. The foreground once again morphs, with the musky wood in the foreground being joined by a pleasant meaty essence. The background salt and pepper provide a perfect supplement to this combination in the foreground. The retrohale begins to get some flavor as well, receiving some of the pepper that came into the background. The two eventually merge, but before they do, the wood becomes bitter, and the draw begins to singe the tongue as the nub is approached. When they do eventually merge, however, the singed tongue is ultimately worth it for the sultry flavor combination. Not unlike the Archetype Initiation I reviewed some time ago, this cigar has great potential, but it’s got a bit of a ways to go. The craftsmanship is there, without a doubt. That pesky hole in the wrapper was the only real flaw in an otherwise flawless design; probably the result of bad handling before it found its way to me. The #5 has a robust flavor profile, there just isn’t enough of it. The Grand Habano Corojo is not by my favorite thing by a long shot, and not something I’d recommend. However, if Mr. Rico keeps at it, then in a few years, I’m entirely confident that he’ll have me eating my words. Charlie Freeman was born in Atlanta, Georgia; his mother is from Greenwich Village and is one-quarter Spanish Cuban. Thus tobacco and New York City were in his blood from the beginning, despite his refusals to indulge in either of them in his earlier years. He was first exposed to cigar culture after moving to New York in 2011. He has been advocating the art of fine tobacco smoking ever since, and he currently works at Ash Fine Cigars in Hoboken, NJ. In addition to his interest in tobacco, Charlie is a semi-fluent spanish speaker, an amateur swing dancer and musician, specializing in guitar, vocals and keyboards.